Antique Burford Bros. Vanity Set. A fabulous antique Burford Bros. washstand vanity set. c:1900. This magnificent set, all 6 matched pieces, have the brown backstamp shown in Kovels, pg. 63, mark H, dating it to the above period. 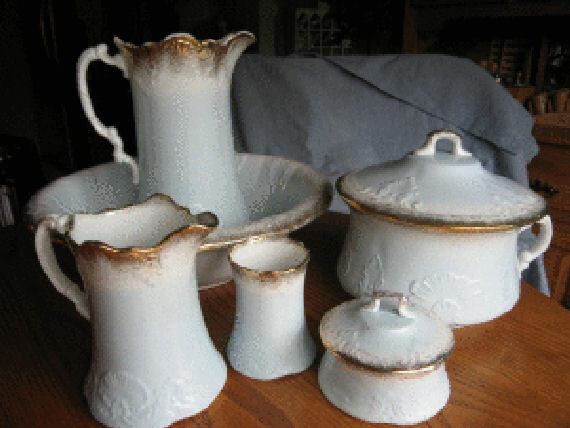 Included is the lidded chamberpot; the huge water pitcher and bowl; the covered powder box; the smaller rinse pitcher; and a toothbrush holder and/or vase. The large pitcher stands 11.75 tall x 8 wide; the bowl is 16.75 wide x 4.5 tall. The color is a very pale blue with gold rims and raised scrolls and fronds. 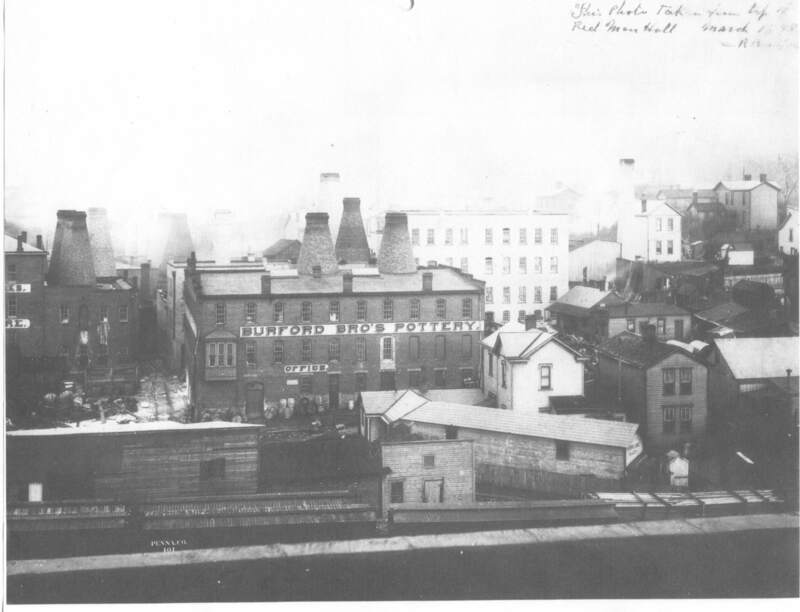 The Burford Pottery, located at on Northwest side of what is now Smith Street. The Eastern side of the pottery bordered on what is Green Lane. 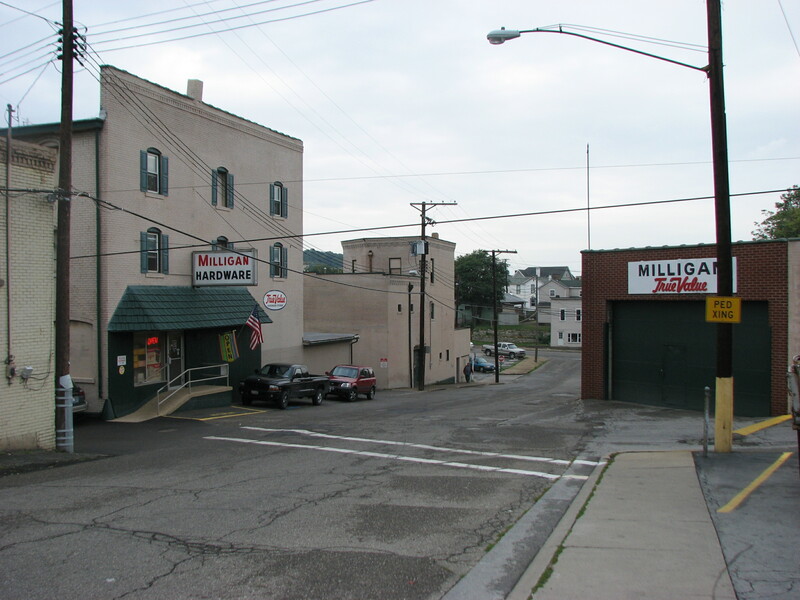 Looking up Smith Street from Dresden Ave.
2009. Above, looking up Smith Street from Dresden Ave. 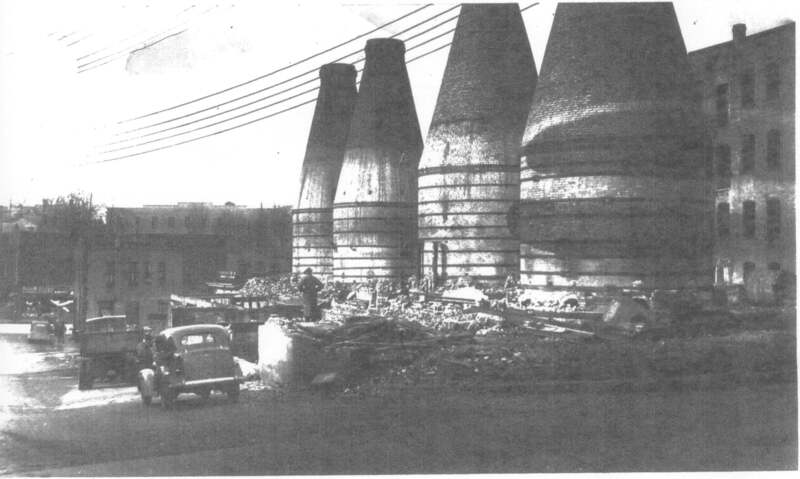 The above picture was taken in 1936 and shows the dismantling of the old Burford Pottery. 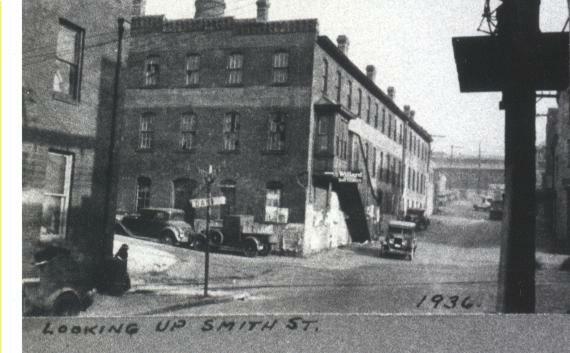 This particular picture is looking down Smith Street towards Dresden Ave. The cross street is Green Lane. 2009. The Corner of Smith Street and Green Lane, where the Burford Pottery once stood. Another view of the same area. 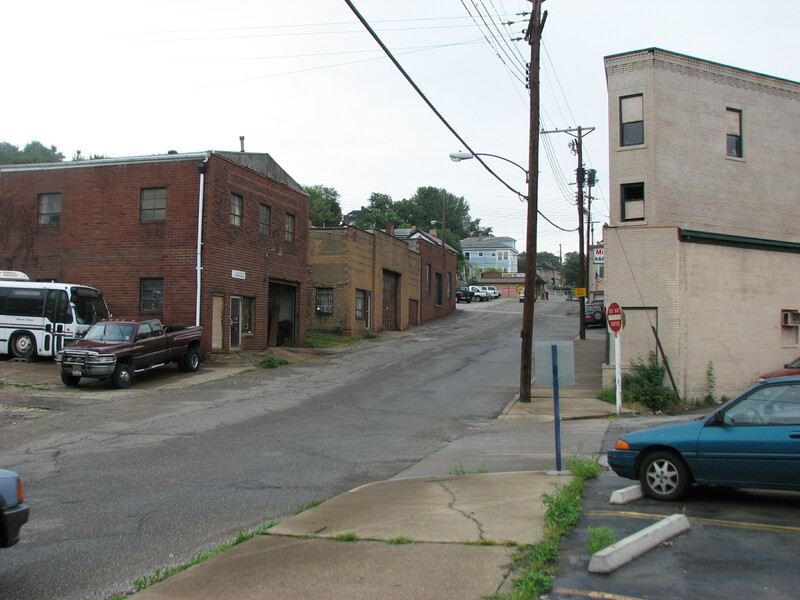 Robert Burford, the oldest of the Brothers, lived in the 100 block of W 6th Street. Probably in the general area of the present day city hall but on the opposite side of the street from the city hall. So far no picture has been found of the house he lived in. We aren't sure what year the above house was built. 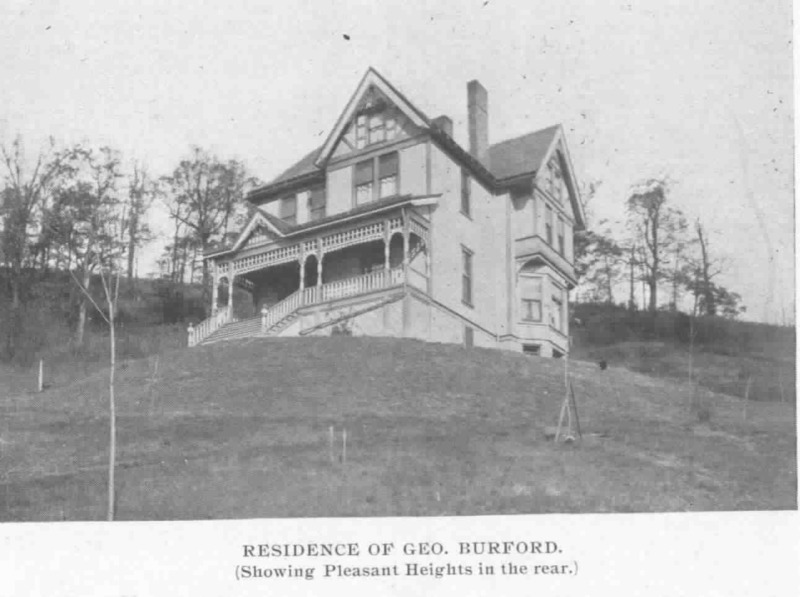 George Burford had lived prior to the building of the above house in a house located on the Southwest corner of Monroe Street and 4th Street. 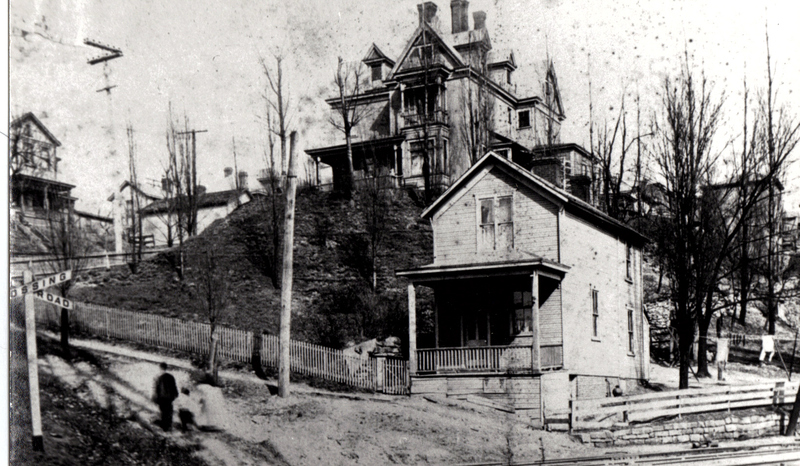 The above house, on the hill above the smaller house, is the house Oliver Burford built or had built in the 1880s and lived in until he died in 1925. At one point in time after the brothers sold the Burford Brothers Pottery Oliver operated a real estate business from this house. It was a big house, twenty-one rooms, sitting on two and half lots. The above picture was taken in 1946. The smaller house in the lower right hand of the picture was the servants residence originally. On the ground where the people are standing you can see the shadow of the Newell Bridge. 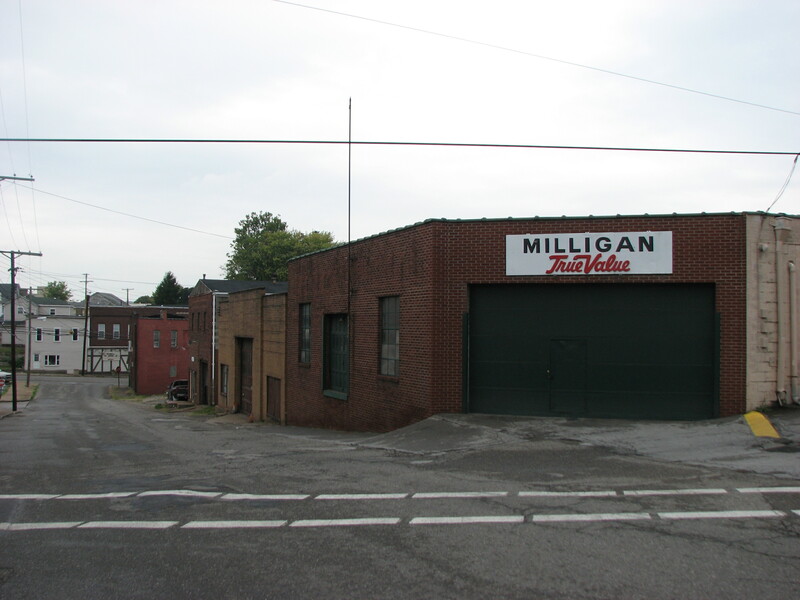 The house was purchased by the state Of Ohio to make room for Route 11 Construction in Jan 1961. The state of Ohio paid 14,000.00 for the honor of having it torn down. The above picture is included to help the reader fix the location of the house in their mind. 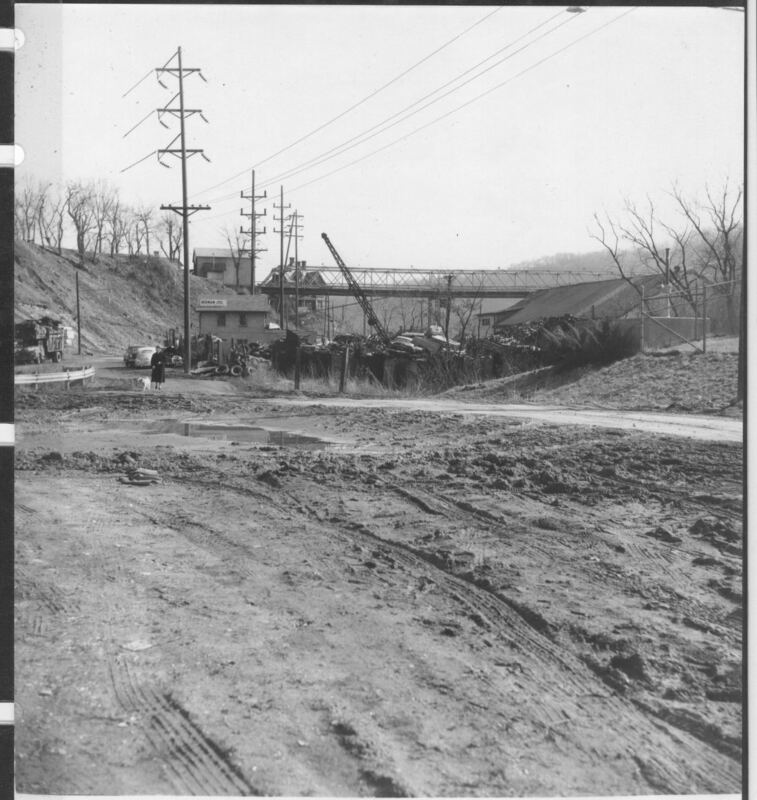 This particular picture was taken as work was being done in the west end area for the construction of Route 11 in 1960. Looking towards the Newell Bridge you can see the house below and through the steel frame of the Bridge. The House sat on a bit of a hill and its distinctive roof makes it stand out in any pictures of the CELLO end of the Newell Bridge from its construction until Jan. 1961 when the house was demolished.